In New York on Tuesday copper for delivery in May fell as much as 1.7% to $2.6080 per pound or $5,750 a tonne after a surge in warehouse stocks in Asia limiting the impact of supply disruptions at the world's biggest mines. Reuters reports copper inventories at facilities controlled by the LME unexpectedly jumped by almost 39,000 tonnes, the biggest inflow in more than a decade and reversing a downtrend in place since mid-December. Shanghai Exchange stocks jumped by 24,000 tonnes to total 320,000 tonnes, an 11-month high. 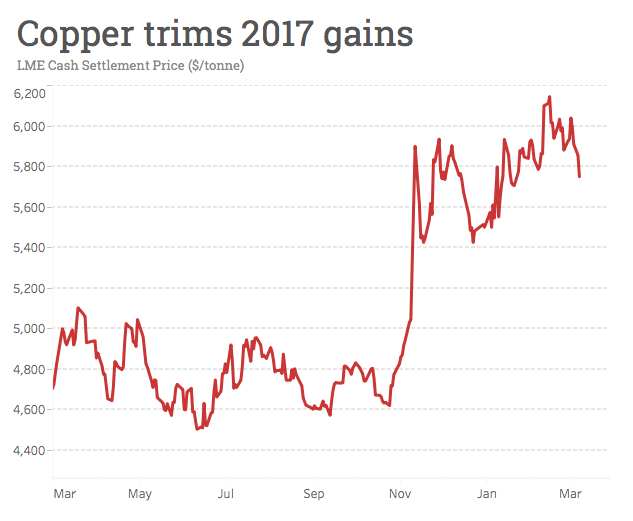 In February copper jumped to its highest level since May 2015 after workers at BHP Billiton's giant Escondida mine in Chile first went on strike, but a slowdown in China which consumes some 46% of the world's copper and diminishing prospects of a bold infrastructure program in the US have shifted market attention to demand strength. The strike by the main union representing 2,500 workers at Escondida, the world's largest copper operation by a wide margin, already in its 26th day shows no signs of ending. Protestors again blocked access to the mine on Tuesday, while management appears to be awaiting the 30-day deadline that will allow it to make individual offers to workers to return to duties. "In 2006, the company went door to door talking to workers’ wives, trying to convince them to tell their husbands to go back to work," Carlos Allendes, a union spokesman said. "We understand that their policy will be exactly the same this time." The previous labour strike in 2006 ended after 25 days. The previous wage deal was signed four years ago copper was trading around $3.40 a pound. BHP, which operates and majority owns the mine with fellow Melbourne diversified giant Rio Tinto, declared force majeure at the mine on February 10. In its annual financial results BHP said it expected full-year production at Escondida of 1.07 million tonnes, which gives the mine a nearly 5% shares of global primary copper production. In Peru top listed copper producer Freeport McMoRan's Cerro Verde mine which recently underwent a massive expansion has also been hit by labour action. The mine union said workers will walk off the job on Friday for a five-day period, but both representatives from the union and mine management did not rule out an indefinite strike Reuters reports. 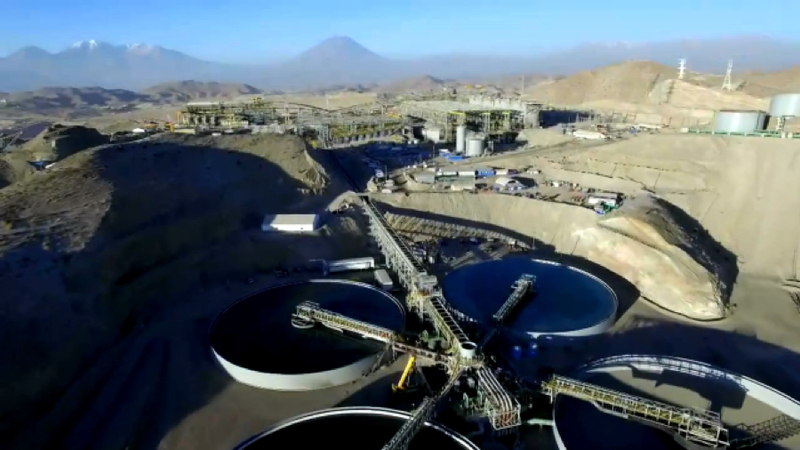 Cerro Verde last year more than doubled its copper output to a shade under 500,000 tonnes. Freeports Grasberg mine faces a concentrate export ban as it negotiates a new operating licence and ownership agreements with the Asian nation. Last week Phoenix-Arizona-based Freeport said it does not foresee a return to business as usual at its operating subsidiary in the country. PT-FI is in the process of suspending its investments in Papua and reducing production by roughly 60% from normal levels. In January Freeport said for each month of delay in obtaining approval to export, the Indonesian subsidiary's share of production is projected to be reduced by approximately 32,000 tonnes of copper and 100,000 ounces of gold.